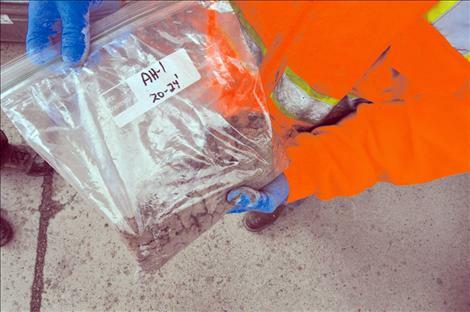 Contaminated soil is sampled and bagged from the old George’s Conoco station in Ronan. 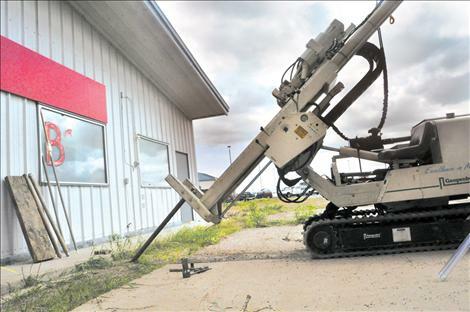 A machine bores into the ground to sample suspected contaminated soil at George’s Conoco in Ronan. RONAN — Hydrological engineers conducted tests at an abandoned Ronan gas station last week to determine if further environmental remediation is needed to disperse hazardous chemicals remaining in the soil after a 1994 spill of gasoline from a perforated 16,000-gallon storage tank. 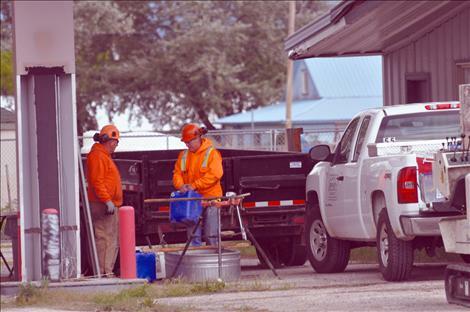 The Montana Department of Environmental Quality has spent almost two decades and more than $3 million on restoring the former George’s Conoco station located on Highway 93 in southern Ronan. Until recently it appeared that a plume of contaminants that stretches from the southwestern corner of the old building to Spring Creek was dispersing as planned, but monitoring wells in the area indicated that concentrations of contaminants underneath the building itself might require more remediation, DEQ Environmental Specialist Patrick Skibicki said. “The plume is attenuating,” Skibicki said of the contaminants, which was 70 feet deep, 1,500 feet long and 400 feet wide at one point, according to DEQ records. 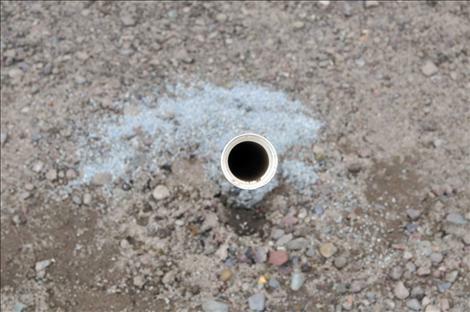 The plume contains some chemicals that are carcinogenic, but have not impacted local drinking water supplies or wells. In 2010 a massive cleanup effort was undertaken by DEQ, using heating technology that removed the chemicals from the soil. 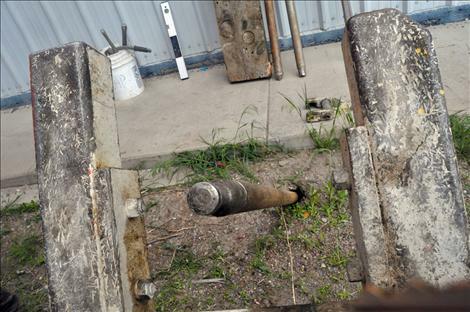 To date, more than 13,500 gallons of fuel have been recovered. Last week Pioneer Services, Inc. Senior Project Manager Kenneth Manchester and two other workers pulled soil samples from beneath the old building. 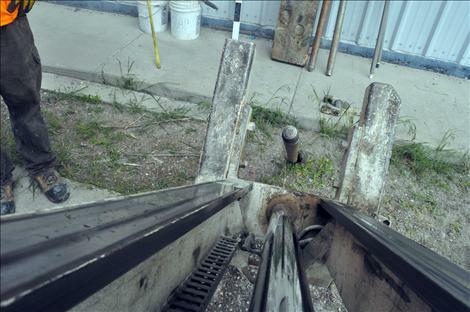 A machine sent a 37-feet-long rod into the ground at an angle. Samples were taken from the resulting hole. It didn’t take fancy instruments to indicate that all was not right with the samples. “You can tell we’ve got something going on there,” Manchester said of the acrid-smell permeating from the samples that were taken over a two-day period. A final report is expected later this summer that will give direction on whether further cleanup is necessary. Skibicki said that DEQ hopes that the prime commercial real estate can be developed again at some point in the future. Funding for the bulk of the cleanup in 2010 was funded by the American Recovery and Reinvestment Act, but subsequent funding will come from the federal Leaking Underground Storage Trust Fund. National media reported last week that Congressional leaders are considering transferring LUST funds to another account meant to pay for federal highways. According to a May 6 report from the Congressional Budget Office, of the 18.4 cents per gallon excise tax paid on all American gasoline sales, 0.1 cent goes to the LUST fund. The remaining 18.3 cents goes to the Highway Trust Fund. The bulk of the excise taxes, including the LUST tax, expires in September 2016, unless Congress reauthorizes them. DEQ lists 4,898 active LUST fund sites in the state of Montana. There are four Lake County sites slated for cleanup between now and 2017 through the LUST fund.